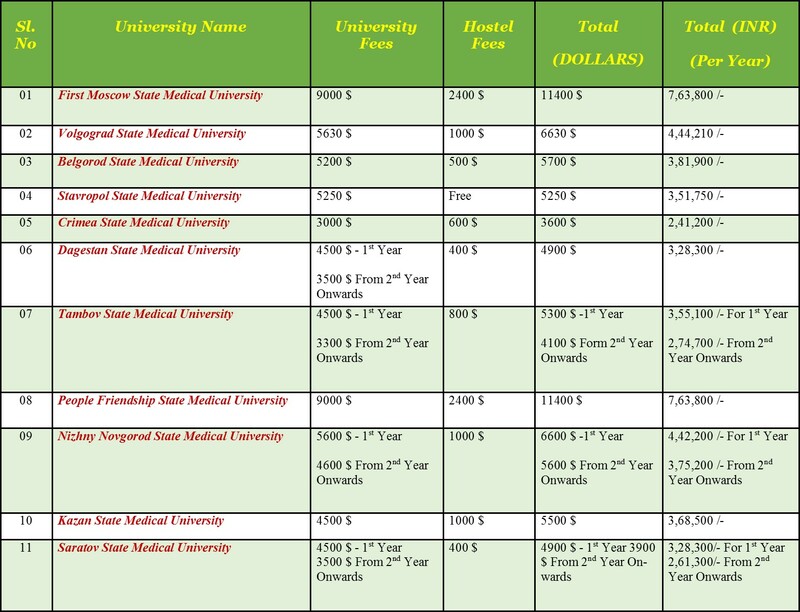 Tuition fee for MBBS in Russia is very nominal and affordable as compared to other countries because it is subsidized by the Russian government. Russian Medical Universities operating beneath the auspices of the Ministry of Public Health of the Russian Federation and are listed within the World Health Organization Directory of “World Medical Schools”. They are rated among the primary ten best medical universities of Russia with high number of international students from India and other foreign countries. Russian medical Universities are providing education to many foreign students across the globe. Already many Indian students are studying MBBS in Russian medical Universities. Because of lowest fees structure and affordable cost of living, Russia is a right choice for studying MBBS. The most typical lodging options for an international student in Russia are a university dormitory, a rental apartment or a host family. It is very important to find the best option within your budget. International and out-of-town students are provided with dormitory places. Normally they are located on the campus or not far from the university. In most cases from 2 to 4 students share a room. Hostel Fees for all the universities were listed in the Fees structure. The Admission and Invitation letters of the University provide a guarantee of accommodation placement at University hostel to all international students who receive them. There are several accommodation options in every university for international students and it is important to consider whether you prefer an independent lifestyle or enjoy living in a community. All rooms are equipped with bed, mattress, pillow, blanket, desk, chair, heater, water heaters and suitable lighting for both study and relaxation. In the hostel each room is equipped with kitchen provided for students to cook food to their own taste. Students will need to supply with their own kitchen utensils.